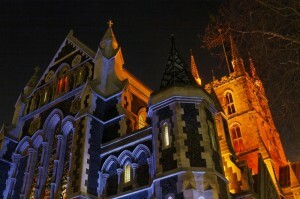 Historic Southwark Cathedral is the oldest Cathedral church building in London. For much of this time, Southwark was part of the ‘other’ London; far from the splendours of the area north of the river, it was the London of the poor, for whom the Cathedral church provided ministry and care. It was also the London of playhouses and taverns; of Chaucer, Gower and Shakespeare who are all commemorated at the Cathedral. Times have since changed and today the Cathedral is at the heart of the vibrant and exciting regeneration of the South Bank. Its fantastic location just by London Bridge and its fabulous acoustics and ambiance makes it a wonderful venue for Legal Harmony competitions.